Delivery in approx:	If you order by noon your posters can be collected from store in the afternoon! Not all sizes are available same day, orders shipped to home take approximately 7 days. High quality photo collage poster prints printed on 260gsm satin microporous photo paper. Poster printing is a great way to add a personalised touch to your modern walls. Our collage poster can feature 2 to 9 of your favourite photos. 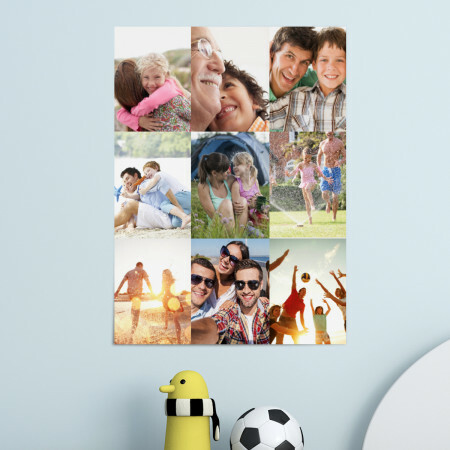 At Max Spielmann we specialise in printing high quality photo collage poster prints that are the smart way to add a personal touch to any room. Simply upload your chosen photos and leave the rest to our team of trained photo lab technicians..
Our digital photo processing lab only uses the latest Epson HD technology along with original Epson inks and the highest quality glossy paper stock to ensure your posters are always sharp, colourful and picture perfect. If you order by noon your posters can be collected from store in the afternoon! Not all sizes are available same day, orders shipped to home take approximately 7 days. Delivery of this product in approx:	If you order by noon your posters can be collected from store in the afternoon! Not all sizes are available same day, orders shipped to home take approximately 7 days.